One of my favorite birds to paint are "hummingbirds." This is a brand new oil painting of an "Anna's Hummingbird." They are all around in my backyard and are fun to watch. The scientific name is "Calypte anna." Anna’s Hummingbirds are welcome backyard birds and are easy to attract. 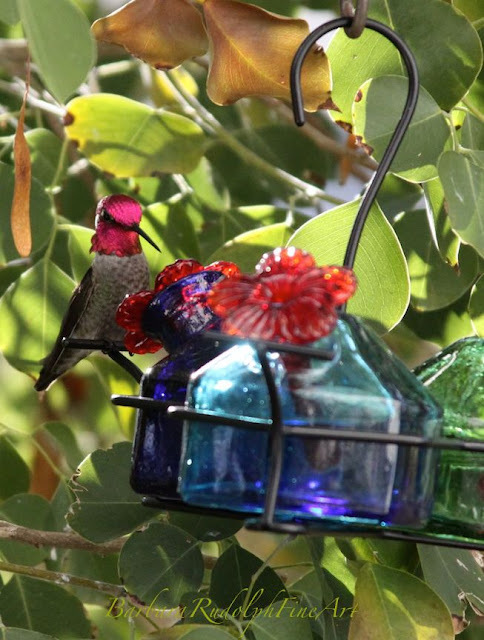 Set out a hummingbird feeder, then mix your own hummingbird food using one part sugar to four parts water. Don't use honey or food coloring. Anna’s don’t migrate much, so don’t be surprised if the bird visits your feeder all year long.